I am using AI8 channel module 6ES7134-6JF00-0CA1 with A1 base unit. I need to use two type of thermocouples. Type B and Type K.
Issue: When I connect type K and apply mV using source then I get difference of 2.5'C if fixed reference temperature setting is selected. When I change it to internal reference junction then system shows the correct temperature readings. So this resolves the issue with K type. But when I use the same settings and connect B type thermocouple and feed the mV then the system does not add internal reference compensation and shows 2.5'C - 3.0'C less readings. I have tried so many combination but nothing is working out. What can be the issue? do you use the specific cable for the thermocouple? And do you connect the cable directly to analogue input? did you check the accuracies and errors of the modules and thermocouples? What are the operational limits and the basic errors of analog inputs and outputs? I am using specific type of cable for both type of thermocouple. I will these details but the main issue is the why internal reference is not added to measured temperature with B type thermocouple and the same is added when type K thermocouple is used. 1. 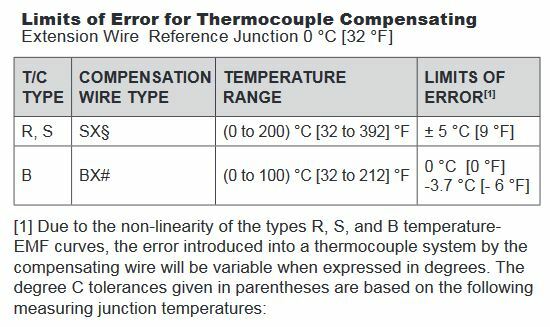 The real question is why the error is only 2.5°C low when Fixed Reference Temperature is selected for the K Type thermocouple. "The reference temperature of the thermocouple is set to 0 °C. As a result, no temperature compensation is performed." The applied test temperature signal should read low by whatever the temperature of the terminal block is. For instance, if the temperature of the terminal block is 15°C, then the applied input should read 15°C low when Fixed Reference temperature is selected, because the cold junction compensation (reference temperature) value is not being added to that channel's measured input value. For the error to be only 2.5°C low at Fixed Reference Temperature means that the temperature of the terminal block is only 2.5°C high. That's a cold site. Do you work with gloves on? Maybe I missed the part in the manual where a Fixed Reference Temperature value can be configured to some value other than 0°C, which would explain the error. 2. Type B thermocouple extension wire introduces error. Here's a statement from a thermocouple vendor. Note that the error is always low. If you actually use measurements at that test temperature, add the error back in as an offset.